In this tutorial we will show you how to setup promotions and discounts in Magento. First, please login into your Magento Admin Dashboard and navigate to the top menu to Catalog>Catalog Price Rules from the top navigation menu. The new page will show you all of the catalog price rules that have been added. If you have not yet set any custom catalog price rules the list should be empty. To add a new rule click on the Add New Rule button on the right. This will load a new page via which you will be able to add a new price rule. First, input the new rule name and descript and set the rule to active. 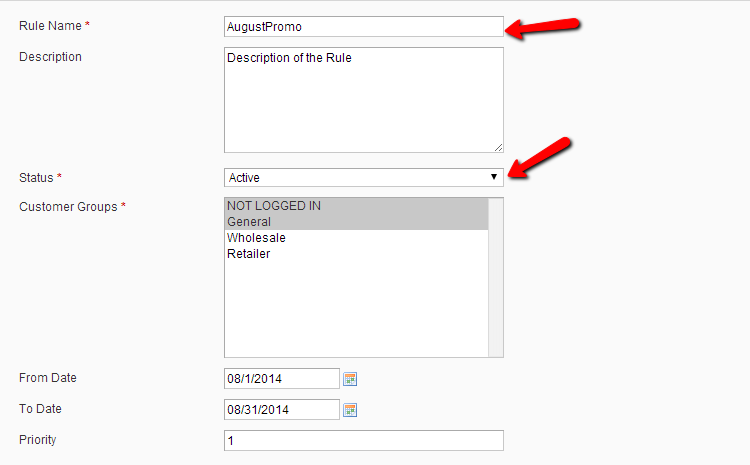 Then you will need to select for which group of your customers this rule will apply. At the bottom you should configure the start and end date of the custom price rule as well as the priority. When you are ready click on the Conditions tab from the menu on the left to select for which product or products group this rule will apply. If you would like to have the rule applied for all products you should leave this section without any changes. To add a new condition click on the + icon. From the drop down menu choose the desired condition for which the custom price rule will apply. When the desired condition is selected you can configure the value of the condition by clicking on the dots. Configure the rule as you find suitable for your needs and click on the checkmark to apply. Next, you should configure the action that the newly created rule will apply to the product or products group you have selected when the conditions are meet. This can be done via the Actions menu on the left. On the next page, you can choose if the rule will apply a percentage or flat discount rate and add the amount. When you are ready with your settings click on the Save Rule button on the top right corner. When your rule is saved you should apply the rule to become active. This can be done via the Apply Rules button on the right. You may also apply Shopping Cart Promotional Rules. These rules take effect based on rules that apply when your customers have certain products or amount added to their shopping cart on your site. To achieve this you may follow the exact same steps explained above but use the Promotions>Shopping Cart Price Rules section.